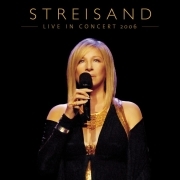 “…what is stunning is the sheer artistry of Streisand's interpretative range. She sings songs like she's telling a story, unfolding ‘Papa, Can You Hear Me’, from Yentl, as if it had the epic narrative of a grand opera. Some were simple, others were ferociously tricky, and yet they were each delivered with a deceptive ease. She made the lyrics of ‘What Are You Doing The Rest Of Your Life’ sound as though they were words she was spontaneously inventing and speaking to a single person in a private place. The someone she was talking to was an arena full of fans who sent up cards bearing messages such as: "I have been waiting to see you the whole of my life." She progressed from one song to the next in a way which was not autobiographical so much as the story of the lives of those who listened. She was singing the soundtrack to their joys and sorrows, triumphs and failures. "People," sang Barbra. "People who need people, are the luckiest people in the world." Last night she had 14,000 of them, all eating out of her hands.